She said: "Everybody was stranded. Currently my husband and I are in a dumpy motel by the airport trying to frantically scrounge together the funds to pay for another way home." They are yet to find an alternative flight home - and she says what was supposed to be a budget trip looks like costing them an extra €2,000 (£1,780). The UK's Civil Aviation Authority has advised passengers who have travelled on an outward Primera flight they will need to make their own arrangements to return to the UK. The Danish-registered airline is not part of the Civil Aviation Authority's ATOL Protection scheme, which covers only passengers booked on package holidays. If you've paid by debit card, and paid more than £100, you could try to contact your bank and ask about "chargeback". However, to get this form of compensation, your bank would need to claw back your money from Primera, which is insolvent. 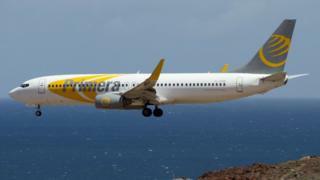 The airline said it had failed to secure long-term financing, meaning it had "no choice" but to file for bankruptcy. Primera's decision to start competing with other low-cost long-haul operators such as Norwegian and Wow appears to have led to its demise. When it began long-haul operations from Stansted in May, Primera was offering flights to New York's Newark airport, Boston, Washington DC and Toronto starting at £149 each way. Airline analyst Alex Macheras told the BBC the airline's growth "simply wasn't sustainable". "The general feeling in the industry was: this airline is travelling a bit too fast in terms of their expansion with a fleet of that size," he said.